St Helens continued their 100% winning start to the Super League season with a dominant win at Salford Red Devils. Classy-looking Saints crossed through Mark Percival, Jonny Lomax and James Roby to lead 16-0 at half-time. Regan Grace then added a fourth try but the hosts had improved after the break and were rewarded when Derrell Olpherts caught Robert Lui's kick and went over. Nevertheless, Saints had the final say, as Roby slid over for his second of the night, after Tommy Makinson's break. On a wet evening at the AJ Bell Stadium, Saints missed just seven tackles to Salford's 25 and were deserved winners, for the fourth time in four matches so far this term. 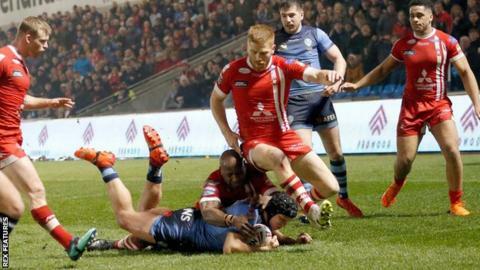 The Red Devils, who have won three and lost two of their five fixtures, could have been beaten by a greater margin, but for Jackson Hastings' superb try-saving tackle to deny an inspired Makinson after half-time. Victory put the visitors top of Super League for 24 hours at least in the early-season standings, ahead of Friday's fixtures. St Helens ran in 11 tries in a 60-10 win when these sides met on the same ground last April. St Helens coach Justin Holbrook: "Salford started the season really well and they've got some dangerous attacking threats so we had to do a really good job on them and we did. "For us to defend the way we did was fantastic. I thought this was our best performance so far. "To have the whole team play well really is pleasing as a coach. We controlled the game really well, I'm really happy with the team performance." Salford coach Ian Watson: "I've got to give credit to St Helens for how good defensively they were. "We can learn lessons from a champion team. I'm really confident in my players' ability to learn. "There was lots of effort and endeavour, something we can build on. We dug in against a really good team, most teams would have cracked before we did." St Helens: Coote, Makinson, Grace, Costello, Percival, Lomax, Fages, Thompson, Roby, Walmsley, Peyroux, Taia, Knowles. Replacements: Paulo, McCarthy-Scarsbrook, Amor, Lees.